Preheat the oven to 400 degrees. Wash and dry potatoes. Prick each potato in several places with a fork or tip of a paring knife. Put the potatoes on a baking sheet fitted with a wire rack or directly onto an oven rack that is in the center of the oven. Bake potatoes for 30-45 minutes or until they are soft when gently squeezed. Remove the potatoes from the oven and let cool for 10 or 15 minutes or until they are cool enough to handle. Split each potato lengthwise. Using a spoon or scoop, remove the flesh from the inside of each potato half, leaving about a ¼ inch border of flesh on each potato skin. Set scooped potato insides aside for another use. Melt the butter and add the salt and pepper. Stir. 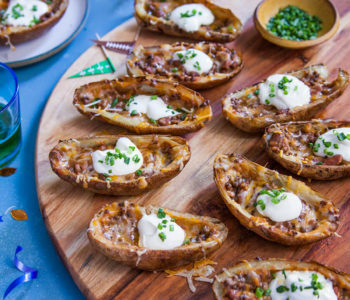 Brush the insides of each potato skin with the butter mixture. Turn the potatoes over, skin side up and place on a baking sheet lined with a rack or parchment paper. 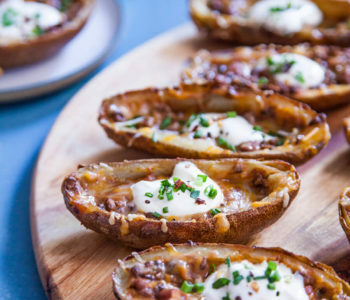 Brush the potato skins with the butter mixture. Return the skins to the 400 degree oven and bake 5 to 7 minutes, or until the butter is foamy and the edges of the skins begin to brown. Remove the skins from the oven. Turn the skins over, flesh side up. Brush with any remaining butter mixture. Return the skins to the oven. Bake for 5 to 7 minutes until the edges of the potato are beginning to brown. Remove the skins from the oven. 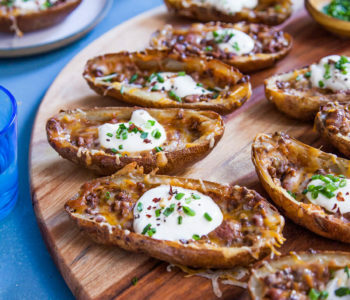 Let cool for about 5 to 10 minutes (you can refrigerate or freeze potato skins at this point. Bring skins back to room temperature before filling). 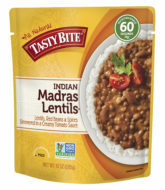 Fill with toppings in the following order: 1 Tablespoon of Madras Lentils and 1 Tablespoon of Shredded Cheese. Return to the 400 degree oven to warm filling, about 3 to 5 minutes. Top with sour cream and chives. Serve skins warm or at room temperature.